I’d heard of the Lara Jean series since they are very popular. I was not, however, expecting to fall in love with the characters and storyline, not to the mention the book covers. The covers of this series are chic, classy and most of all girlie with how they depict Lara Jean’s room as she ages. The best thing about the covers are the titles are written in Sharpie. So realistic looking with parts that look faded. 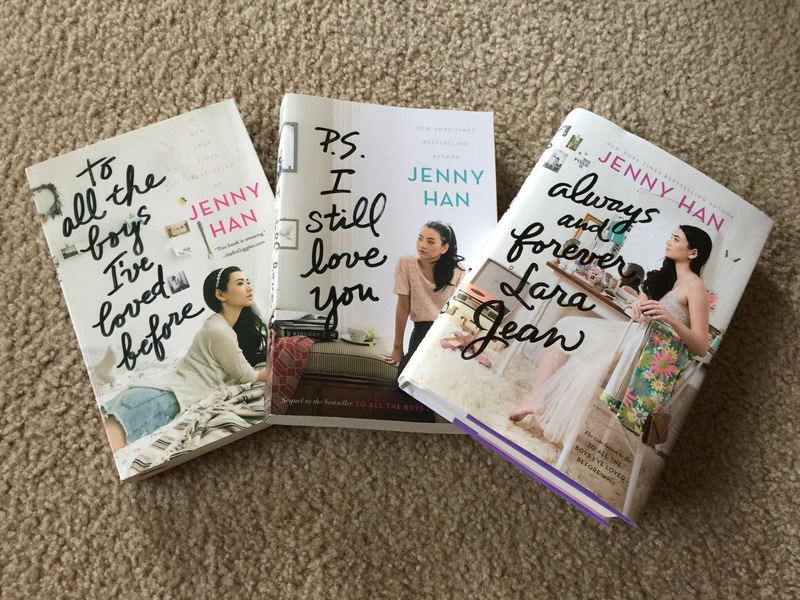 The covers are like the storyline’s cheerleaders asking new readers to dive into Lara Jean’s world. Lara Jean Song Covey is raised in a single parent home due to her mom sadly passing away when she’s younger. It’s just her older sister, Margot, Lara Jean and their youngest sister Katherine aka Kitty. Lara Jean is a lot like me in that she’s nerdy, creative and somewhat of a homebody. The Covey girl’s dad is a doctor whose gone often. This series is about Lara Jean’s life: her family relationships, her childhood friendships, a first love and life’s changes. I can relate to Lara Jean in many ways, yet she reminds me think of my younger sister. Growing up I was the eldest, but my sister is the classic bossy older sister personality. I’m more of a passive, keep the peace personality type. Kitty’s character also, made me think of my younger sister in that she has an eagle eye of what’s going on, speaks her mind, but secretly is a softy. She’s like an M&M. Hard outer shell, but soft on the inside. I’m not into cooking, but Lara Jean is a talent and she decompressed by cooking just like my sister. First loves and boyfriends are powerful. Lara Jean pretends to date her big crush Peter K in order to make his ex-girlfriend jealous. The plan backfires when Lara Jean and Peter fall for each other. Lara Jean used to be best friends with Peter’s ex. The relationship and friendship dynamic in the series is in-depth. If you like old-fashioned romance set in a modern setting I highly recommend this series. The characters are well fleshed out, believable, versatile and most of all memorable. My favorite characters are Lara Jean and Kitty. I like Kitty because she is sassy, affectionate and funny. She’s a classy broad in a little kid’s body. I will definitely be reading this series again down the road. Thank you Jenny for writing such a heartfelt series that stays with you after the very last page. When’s the movie coming out?